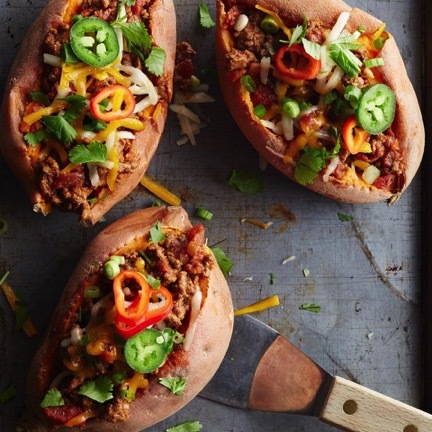 Transform ordinary baked potatoes into a full dinner with these chili-topped spuds. In this healthy recipe, we use sweet potatoes for an added nutrient kick. Sprinkle on extra toppings as you see fit—sliced scallions, chopped fresh cilantro, diced avocado and sliced jalapeños are all tasty choices. Preparation: Prep 30 min. Read in 30 min. 1. Cook beef, onion, bell pepper and garlic in a large skillet over medium-high heat, crumbling the beef with a spatula, until the meat is browned, 8 to 10 minutes. Stir in chili powder, cumin, oregano and coriander; cook, stirring, for 30 seconds. Add tomatoes (with their juice) and water and simmer for 5 minutes. 2. Meanwhile, prick sweet potatoes with a fork in several places. Microwave on High until tender all the way through, 12 to 15 minutes. 3. Serve the sweet potatoes topped with the chili and cheese.